I made this cake a while ago when one of my friends was visiting. He likes this cake a lot and I try to make it every time he comes over. The recipe is simple as it uses a ready made cake mix. I use the Duncan Hines Moist Deluxe Pineapple Supreme cake mix but even a regular yellow cake mix should be enough. This is my entry to this month's AFAM-Pineapple event. Preheat oven to 350F. Place butter in ungreased 13x9 inch pan and keep inside warm over for about 2 min till the butter is completely melted. Sprinkle brown sugar evenly in pan to completely cover the pan. 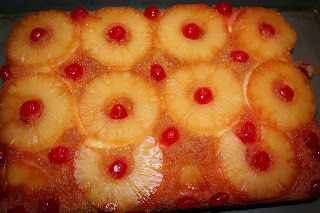 Arrange pineapple slices on brown sugar and place maraschino cherry halves, cut side up, in center of pineapple slices. You can also keep cherries in the border. Blend dry cake mix, water (juice from the pineaplle can can be substituted for water to increase flavour) , oil and eggs (add flour only for high altitude baking) in a large bowl at low speed (abt 30 sec). Beat at medium speed for 2 minutes. Pour batter evenly over the fruit in the prepared pan. Bake at 350F for about 35-45 minutes or until toothpick inserted in center comes out clean. Cool 5 minutes in the pan and invert onto heat serving resistant serving plate. This cake tastes best when its served warm. A scoop of vanilla or pineapple ice cream can also be added while serving. The cake looks delicious Deepz. Thanks for sharing. That is rich that really do not doubt it. I would like to know more about how to prepare this delicious and I'm not very artist in the kitchen. I am very interested thanks for sharing information. I love this blog.